When you are looking for a job and you have an interview scheduled, the last thing you would want is to have it rescheduled. But sometimes there are some inevitable circumstances because of which you have to take such a step. The right thing to do is write a formal reschedule of job interview email. You can use the reschedule interview email template to create a personalized draft. We bring a reschedule a job interview email sample to help you with. 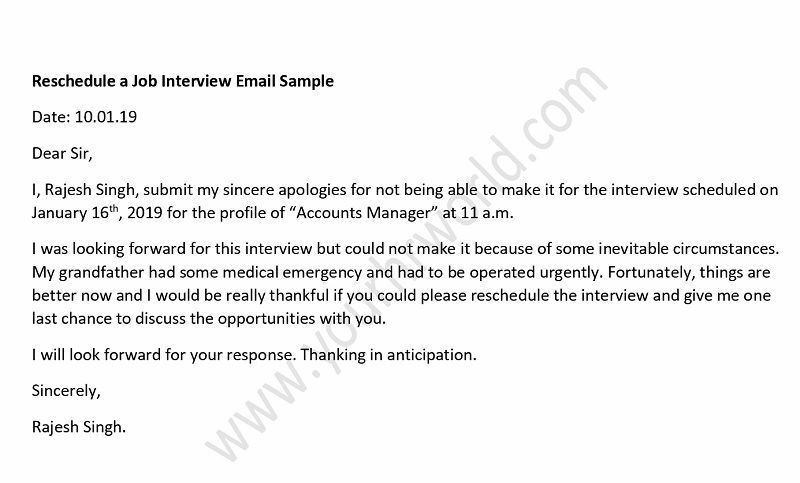 Use this proficient reschedule interview email template to create your own. Use the reschedule of job interview email to ensure that you are able to have it rescheduled with ease. I, Rajesh Singh, submit my sincere apologies for not being able to make it for the interview scheduled on January 16th, 2019 for the profile of “Accounts Manager” at 11 a.m. I was looking forward for this interview but could not make it because of some inevitable circumstances. My grandfather had some medical emergency and had to be operated urgently. Fortunately, things are better now and I would be really thankful if you could please reschedule the interview and give me one last chance to discuss the opportunities with you. I will look forward for your response. Thanking in anticipation. Finding the best employee for your company is surely not an easy task. You have to put your time, energy and resources to select the right candidate. While hiring a new employee, you want to make sure that all the efforts that you have put in finding the most suitable candidate don’t go waste. In this post, we have come up with 8 interview tricks that are used by HR managers to make sure whether a particular interviewee will suit the profile or not. Follow these 8 techniques to interview candidates to never go wrong. Always ask the interviewee some questions about your company. This is an important trick as you get to know how serious the person is about the job and how much research he has done to crack the interview. This is one simple trick which will help you differentiate between the serious and not-so-serious candidates. Most of the times we simply ask the person to share his strengths and weaknesses and usually people mention anything they feel is impressive. You have to get more creative with your question to get an honest answer. Ask them what their co-workers or boss thinks about him and chances are that he would not lie because this information can be easily cross checked. When people talk, they always choose to talk about things or instances that they feel are important. This helps you know how intelligent is the person while talking, how he thinks, what things are important to him. Always hire those people who are very specific and are able to present their thoughts with clarity because they will make effective and efficient workers. To know a person better, you can always interview him with role play a challenging situation. For instance, you are not a happy customer and he has to deal with you. From body language to way of talking, from tactics of handling the situation to levels of confidence, each and everything can be judged with role play because this is how the candidate is expected to behave when he would be in the similar kind of a situation for real. You can always ask the candidate that how he would sell a particular product to the customer. And when he would give you the answer, he would give you enough points to know whether he is the right pick or the drop. Companies want employees who can take initiatives as they are self-motivated and committed. You can ask the interviewee about situations when he took the charge and brought the change. It is extremely important that the person you are hiring can take initiatives to do jobs or else you cannot expect your company to grow. An organization is like a big team and you want people who can be a part of it. Therefore, it is extremely important to look for a team player. No company desires employees who are busy doing their own jobs and they do it right but as a team, they are a big failure. You definitely want to hire someone who can take charge. Therefore, having people who can decide what they are suppose to be doing in a crisis situation are the perfect pick. You can always do so by giving the candidate a hypothetical situation and ask what he would do in such a situation. You would get enough information in his answer which will tell you whether the candidate can deal with difficult situations or he would just do nothing. These are some of the tricks that can make the interview session very productive for you. A candidate who clears all the 8 points mentioned above is the best fit. So next time you are interviewing someone for your company, keep these techniques in mind to see amazing results. One of the most common questions we all are asked during our interviews is about our strengths and weaknesses. And this is also one of those questions we are confused about how to answer in order to increase the probability of selection in interview. The best strategy in order to crack the interview is by highlighting your strength and talk about your weakness in a way so that you can present it as your strength. You must present it in a manner in which it looks like a positive trait of your personality. So before going for the interview, make sure you have worked upon your answer to make it complete and also impressive. Here are some of the strengths given below along with how you should present it in the interview. When you say you are focused, you must talk about your ideas. You must explain that how strong you are at concentrating when it comes to your targets. This can surely work as a wonderful strength for you. Every company wants an employee who has the ability to take good rational decisions and if you can explain the interviewer your ability to make the right choice then you have done a great job. You can also talk about learning from mistakes, following an analytical approach to take a decision etc. Personal values include dedication, hard work, professionalism etc. By mentioning personal values, you can create a strong impression on the interviewer. But make sure that whatever value you are mentioning, you should be able to quote an example of the same. If you have clarity in your thoughts, actions, plans and goals then you must mention that to the interviewer. You can also mention that how this has helped you have better understanding of your passion. Confidence on yourself is the biggest strength and you must mention it in the interview. You ability to have confidence in your actions, in your life brings out positivity about you. Companies look for individuals who don’t get worried seeing a problem but have the confidence to face challenges in life. Here are some of the weaknesses which if presented smartly then change the game. You can be strict about various things. You must explain correctly that what makes you strict. Being strict about work done will always be a good thing. Being strict about discipline is always favorable. You can have greed for anything but if it is greed for performance, for your new target, for more profits for company then this need will surely be appreciated by the company. So never fail to explain your greed. This word has a negative connotation and being bossy can be harmful for your image. But you can always present it in terms of leadership which is a positive word. So you can mention that you are bossy but selectively bossy as you give room to others to work but you also lead them to the right way. This means that you are scared of taking risks and no company would want that. So mention what makes you fearful. Quote an instance that doesn’t imply that you are scared of risks or uncertainty. You can always mention that you are impatient when it comes to performing slow than usual, performing below expectations and committing mistakes. You are impatient when people arrive late. This helps you achieve your goals effectively. So while mentioning your strengths, you can comfortably state 2-3 strengths but while mentioning your weaknesses, you don’t have to be generous as just one weakness is fine. Always support them with instances. Do leave room for the interviewer to assume anything wrong. Know about what things to avoid to save yourself making worst impression at the job interview. While going for a job interview, we want to deliver a wonderful performance so that we get noticed and we get picked in the hiring process. And in order to be successful, we sometimes end up getting nervous and miss on hitting the target. This post unveils 10 important things which you must avoid making to save yourself from making a bad impression at the interview. With little vigilance, you can easily avoid them all and make sure that you are ahead of your competitors. One of the most common reasons because of which people ruin their interviews even before they have begun is by arriving late for the interview or not arriving at all because of various reasons. Make sure that you are prepared to reach your destination on time. Confirm your interview in advance as it is the professional thing to do. Take extra time in hand so that even if you get stuck in traffic, you are still able to make it on time. But be careful that you don’t arrive way too early. Usually we all make sure that we are nice to each and every person we meet when we reach the company office. But sometimes some of us act as if they are doing a big favor by arriving for the interview and this reflects in their behavior. This kind of behavior can make things difficult for you. It is very important for you to communicate your qualities, skills and talents to the interviewer because only then he will hire you. Interview is the only way to sell yourself and let the interviewer know what qualities make you a suitable candidate for the job. You need to know beforehand that what is the dress code for the interview so that you don’t end up dressing too much or too casual. The best thing to do is to ask the person who has scheduled the interview about what is the dress code so that you can dress according to the job profile, industry and the company. Once your interview has started, you must make sure that you have switched off your phone and kept it aside. Don’t try and look at your watch. If there is something for which you are running late, do not panic or else you would mess up your interview. And most importantly, do not ever say in the middle of the interview that you have to make a call. You must be focusing on your interview without getting distracted. You must never speak what you really think. In case you start speaking bad about your last employer or your boss then you are in deep trouble. The interviewer is going to think that you would do the same to his company and would never select you. Make sure that you only speak positive things during your interview and keep all the negativity aside. If you are planning to simply get up and go then this is the worst thing you are going to do. You must prepare yourself before the interview. Know about the position, the company, the industry and other related things so that if you are asked anything about any of these points, you have a strong answer to give. Take some time and Google about the company, match your qualifications with the job. Some of us exaggerate or lie about our experience or our academic degrees just to create a strong background but what we forget is that while doing a background check, if employer gets to know about our manipulations then we are going to lose the offer. So make sure that you speak the truth, minus all the exaggerations and incorrect information. While wrapping up, interviewer generally asks if you have anything to say. Use it as a chance to express gratitude for considering you for the profile. The idea is to communicate that you are sincerely interested in the job. We often forget to thank the interviewer for the interview or write a follow up message and this is considered quite unprofessional. Make sure you do send a hand written thank you note or email to deliver a positive impression. When expenses are more than what your present salary offers, you must start looking for a second job which can help you earn some extra money so that you can not only pay your bills comfortably but also add some more experience to your resume to make it more impressive. With a second job you can also make a gradual transition to a different career. Flexibility of work schedule and of future employee etc. Once you have answered all of the questions mentioned above, it is time to move ahead and read the tips for finding the second job. Given below are some of the very useful guidelines using which you can land up with a good second job. You can begin the search right away without investing much of your time and energy by using online job portals which help you search for jobs of your choice. All you need to do is to choose the right keywords, set the filters like income, place of work etc. and start searching for the best possible choices of job openings which match your constraints. As it is a second job, you really need to set the filters properly so that the results fit your requirements. If you are already working then you can manage to get a traditional part time job, as it is impossible to manage two full time jobs. There are various online job portals that offer part time jobs. You need to enter the right keywords and you will have a complete list of part time job opportunities. Moreover, you can directly apply for these jobs without much of hassle. Freelance jobs are another good idea to have a second source of income. There are various industries like fashion, media etc. which hire freelancers for projects and they pay good. If you like to write or you are a professional designer then you can easily find freelance work. You can also pick up one such project or a job to work like a freelancer and enjoy additional income. Try Freelancer, Elance etc. for quality freelance work. These days there are lots of opportunities when it comes to online jobs. Various work from home jobs are available on online job portals that are a wonderful way of increasing your income. But while doing so, you must make sure that you connect with genuine sites and do not get involved with fake job providers. You really need to create a strong social network of family, friends, relatives, neighbors and other social or personal contacts to inquire them about job openings in their respective companies or to inform you about a job opening they know of. You can even ask them to refer you to their bosses as there are a few companies which always prefer hiring recommended candidates. If you think you cannot work for someone else and you have the passion to work for yourself with complete dedication then starting your own business is a great thought. You must begin small and after complete planning and then gradually create your own success story. You can even look for partners if you think that you would need a companion who can work with you for better results. It is always good to visit in person and meet the employer or the manager in order to inquire about the job. This works wonderfully in hospitality industry as they employers look for good personality with good etiquettes but make sure that you visit during the non peak hours so that you are able to have a comfortable conversation. Once you have applied for the job, you are not sure when you are going to receive the call for interview or your application has been rejected or selected. Sometimes employers received hundreds of applications for a job because of which they fail to inform the rejected candidates and we all keep waiting for the response from their end. In some cases, companies mention that they will get in touch with only those candidates who have been selected for the interview and in other cases, companies do not state anything. This post talks about different ways in which companies notify applicants about the interviews. It is important that you stay active and aware about these notification mediums so that you do not miss on being contacted. You can het either emails or voicemail’s or messages from the employer, informing you about the interview. It is important that you keep checking your email and voicemail from time to time to ensure that you have not missed on any of these messages. These messages will contain the pre-scheduled time and venue of the interview along with confirmation from your end. In case, the company wants you to be present with some preparations then you will be informed for the same in advance. The company will also inform you about the format of the interview so that you are prepared accordingly. Once you have received an invitation for the interview, you must respond to it either by confirming it or by rejecting it. These are different ways of notifying the applicants about interview opted by the companies. Whenever we come out of the interview room, we always think about things we could have said that would have helped us earn more points. We always repent for not being able to express our ideas or thoughts in a more impressive manner. We always have something that could have helped us deliver a stronger performance. Well, once the time is gone, it is gone forever. You can surely not alter your actions but you can definitely work on the interviews that you are to face in future. Whether it is your very first interview or you have faced a couple of them in your career, the one thing that you must keep in mind is that you must always prepare for the interview. Remember that every interview is distinct and has something unique about it. Telephonic interviews are different from panel interviews or other face to face interviews. Therefore, you must do complete homework before the final day in order to make sure that no stone is left upturned. Preparation is a must so that you can crack the interview without any hassles. Thinking that looks don’t matter is not the wise thing when we talk about interviews. You have to dress right for the interview. Being over dressed or under-dressed might not be the right thing to do. Right clothes are important to create the right impression on the interviewer. It is a reflection that you are serious and well prepared for the meeting. The best thing to do is to simply ask the recruiter about the dress code. Never presume about the code but simply seek information about it. Whatever is the dress code, keep it subtle and simple. Do not wear anything loud or heavy. Once the interviewer is done with asking questions, he will ask you if you have any questions to ask. The idea behind this act is to find out how serious you are about this job, about the company and about this interview. The questions that you are going to pose will reflect your awareness about the job for which you are applying and the efforts you have put in finding about the profile. So prepare a few questions about the company or about the job which you can ask if you are given an opportunity to ask. This will surely help you earn extra points. Whenever you are answering the questions, it is very important that you answer it with complete eye contact. If you are not able to keep up with the eye contact and struggle while answering the questions. If you are not able to do that then it will be considered that you lack confidence and are not sure of what you are saying because you have not prepared well for the interview. This will be taken as you have not done enough research about the company. Make sure that you have prepared well. Rehearse for the answers in advance so that you don’t miss out on anything important. This will give you stronger confidence to answer the questions which will help you have a firm eye contact. Gratitude never hurts rather it always creates a beautiful association. When you are done with your interview, never forget to send a thank you note to the hiring manager who had interviewed you thanking you for taking his time out to interview you. This is very important to stand out in the list of finalists and create a strong impression on him. But make sure that you don’t take too long to send it. These are the 5 things which can help you deliver a wonderful performance at the interview thereby increasing your chances of selection.